Dena Roche is afraid of barking dogs. She knows her fear is irrational, but the sound, even in the distance, sends her into a full-blown panic attack. For pet lovers, it’s hard to imagine anyone having such a severe reaction to a dog or cat, but it happens. It’s called a specific phobia, and the condition is much more common than many people realize. According to the Anxiety and Depression Association of America (ADAA), approximately 19 million Americans suffer from a specific phobia, which is an “excessive and unreasonable fear in the presence of a specific object, place or situation.” Fear of particular animals like dogs or cats is one of the most common specific phobias. People with a dog or cat phobia describe feeling extreme anxiety when they're near the animal or even thinking about the possibility of encountering the animal. Symptoms include feelings of panic, dread and terror, a racing heart, shortness of breath, trembling and an overwhelming urge to flee. People with phobias not only fear a dog or cat harming them, but are equally afraid of the panic response that accompanies an encounter. People suffering from cat or dog phobias are hypersensitive to things other people wouldn’t even notice. “They’ll become attuned to the potential jingling of a dog collar that most people would ignore,” says Dr. Simon Rego, director of the Cognitive Behavior Therapy (CBT) Training Program at Montefiore Medical Center/Albert Einstein College of Medicine in New York. “It’s amazing how generalized or specialized a fear can become,” adds Dr. Rego. In Roche’s case, dogs themselves don’t cause a reaction but the barking does. Roche explains that if she’s in a place she can leave, her reaction isn’t as bad. But if she’s at home and hears a barking dog nearby, she has to go inside and stay there. In fact, it’s gotten to the point where she won’t use her own backyard because she’s afraid a dog will bark somewhere in the neighborhood. Most phobias begin in childhood or adolescence, says Dr. Mike Vasey, Ph.D., a professor in the Ohio State University’s Department of Psychology. There are several scenarios that might be the impetus to a phobia. 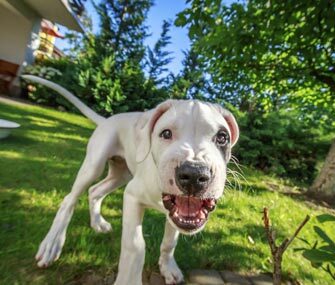 A direct experience or traumatic event, such as a dog bite or even an overly friendly dog jumping up on an unprepared child might lead to a phobia. Sometimes children take cues from their parents. If a mother is afraid of dogs, her son might model his fear on hers. Finally, Dr. Vasey says, sometimes all it takes to trigger a phobia is for a trusted adult to tell a child that dogs or cats are dangerous.